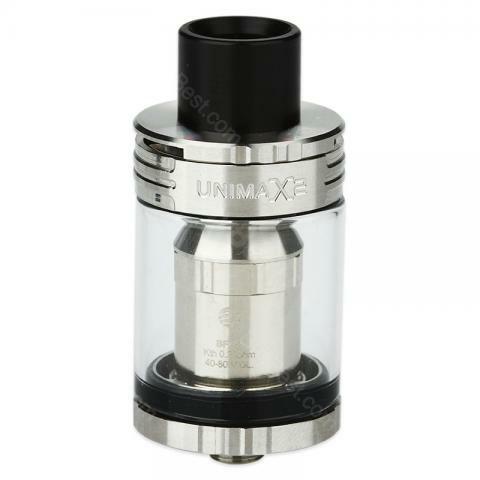 The UNIMAX 2 from Joyetech is a 5ml TFTA-Tank. Its 510 thread allows it to work with most 510 thread MOD, like Alien, G-prive 2, RX2... The replacement coils are BBFL/BFXL coil heads and BF series heads (exclusive BF RBA/LVC/QCS) with BF adapter which are also available in BuyBest. With its large 5ml capacity and big airflow, it will definitely offers you the largest airflow and purest flavor. We are selling Black and Silver color with the best price now. Excellent, fast processing and shipping, full traceable, well packaged, quality product. i like the top filling and special 5ml juice capacity. Tank came with extra coil and glass, that's thoughtful. Joyetech unimax is with simple and classy looking. It works very well too. Love the unimax 2, especially the pure taste. Price is very good, would definitely buy more here.